BAe Hawks over Beddgelert Forest in the Caernarfon valley, North Wales. and prepare to re-attack 4 similar aircraft following a succesful 'Bounce'. the two aircraft are about to turn left and head for the A-5 pass in Snowdonia. with derision by Hunter Pilots at the RAF's tactical weapons training unit. of the Hawk to replace the rugged, versatile and much loved Hunter. "FORGET HAWK - FLY HUNTER"
was one typical bumper sticker at the time but now 25 years on, such scepticism seems barely credible. With the arrival of the first Hawk aircraft at RAF Valley in November 1976, a new era of RAF flying training began, and the first of thousands of fast-jet Pilots discovered the joys of flying this truly thoroughbred aircraft. Since then, the BAe Hawk has earned the reputation as the World's best advanced trainer and light strike aircraft. The basic design has been refined and improved in a series of variants ranging from multi-role light fighter to the US Navy's carrier trainer. But the one quality that sets the Hawk apart from other aircraft is handling characteristics. In the artist's own words, - "I had flown the Gnat and the Hunter and in 1979 had just finished fling Canberra PR9's before transferring to the Jaguar, when I was given the opportunity to get some flying on the Hawk. It was a revelation. Here was an aircraft that was pure joy to fly. At low level it settled comfortably at 450 knots at around 150 feet and it could be flown into the valleys under the most frightening weather safe in the knowledge that it could be turned around without losing airspeed almost in its own length. And at medium level?, 1 v 1 combat in this aircraft is something else, - compared with the Hawk, the Jaguar is like flying an anvil". 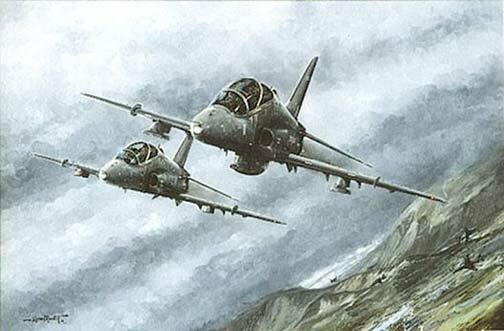 The outstanding handling and agility of the Hawk made it a joy to fly in any situation, but for most Hawk Pilots nothing compares with the "knife fight in a telephone box" excitement of Hawk versus Hawk low-level tactical evasion training in the mountainous terrain as portrayed in HAWK COUNTRY. Set over the A4085 road by Beddgelert Forest in the Caernarfon Pass, North Wales, two grey-painted Hawks pursued by a 'bounce' fly out of the picture in a left hand turn heading for the Capel Curig and the A5 Nant Ffrancon/Ogwen Pass, whilst three other Hawks, resplendent in the RAF's new gloss black paint scheme turn hard against the towering backdrop of cloud-capped Snowdon. This is Michael Rondot at his very best. High speed, low-level dogfighting, superb detail and technical accuracy in a brilliant print of "been there, done that", action.